Some of the greatest inventions were born out of despair or by mistake. Diners Club is one of such amazing cases. The idea came to a man after he left his purse at home and was unable to pay for his diner. At the time of the incident he was quite embarrassed and decided that there should be other means to pay other than cash. Later, in 1950 he introduced the multipurpose payment card to become the first to introduce this payment option. 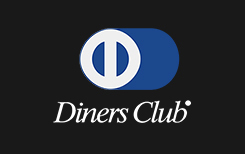 Diners Club is the most suitable for those, who love to travel, dine and entertain, as the company has established partnership with businesses in these sectors. Diners Club members receive access to special areas in more than 700 airports, great hotel deals and discounts at finest restaurants. Thanks to agreement reached with MasterCard, customers can use their cards to pay at millions of locations around the world. If you see MasterCard logo that means you can use Diners card. Diners Club will be most beneficial for those, who don’t just need another payment solution, but at the same time want some privileges. The card itself isn’t any different, but it offers lots of rewards, and some of them are exclusive deals. Gamblers would benefit the most from using the solution if they travel a lot and want their trips to be as comfortable as possible. First thing you need to do is apply for a card. But that isn’t always possible. The company might stop registration of new users for some period of time. You’ll need to visit local Diners website and fill in the form to submit your application. Note that it’s not a one step process. Potential customers will have to provide a lot of details and even provide employment information. So, don’t expect the process to be fast. Once the card is issued, you can use it as a regular credit card. Log into your gambling account, go to the cashier and enter information you are asked. Payments should be instant. US punters would have to find other options to buy casino credits, since Diners Club assigns special code indicating the money are transferred to online casino operators. As a result, US banks reject these transactions. Many gamblers prefer using Diners card to fund their e-wallets, because it’s much safer than paying directly with a card. That gives US players the chance to deposit at online casinos. The company offers tons of great rewards, but the service isn’t free. Premier and Elite card holders pay $95 and $300 a year correspondingly. Diners is known as ahighly reliable and secure company. They are the most experienced in this type of business and therefore know how to make sure their customers are happy and well protected. Being a member of this club means you shouldn’t worry about anything and will just enjoy smooth payments. This card is accepted by more than 30 million retailers around the globe, so you will rarely have the need to pay with any other card or withdraw cash. But the biggest advantage is a rich package of rewards. The company has built relationships with various businesses, focusing on travel, culinary, sports and entertainment, and card owners benefit a lot from these relationships. Premier and Elite members will also benefit from Personal Assistant feature. The company employees can make various reservations at user’s request. This is a 24/7 service. On top of that, everyone is getting access to special airport lounge areas and car rental discounts. For each dollar spent members receive 1 loyalty point. After collecting certain amount of points, customers can exchange them to numerous gifts. Some can even get personalized rewards or tailored travels. The only disadvantage is that using Diners Club card isn’t free. But considering the amount and variety of rewards and promotions, the annual price is well worth it. But US players would point out another disadvantage, which is rejected casino deposits.